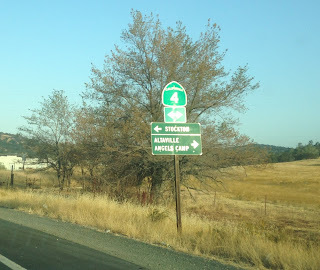 Back in 2016 I frequently used Signed County Route E15 as a short cut from California State Route 108/120 in Tuolumne County to CA 4 in Calaveras County. 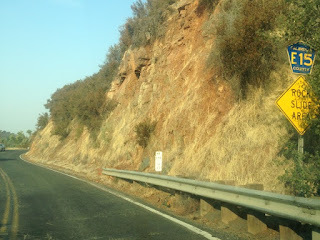 E15 is a 12.91 mile long Signed County Route which was defined in 1974 according to CAhighways.org. On the Tuolumne County side E15 begins from CA 108/120 at O'Byrne's Ferry Road. Traffic is warned along CA 108/120 not to pick up hitch hikers due to the a corrections center which is oddly placed next to the Sierra Conservation Center on the Tuolumne County side of E15. E15 is one of the better Signed County Routes in terms of signage. While some of the shields are old they are generally well placed in a logical enough way to convey to the traveler they are on E15 which can be a rarity at times among the Signed County Routes. 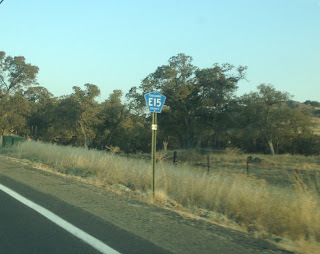 E15 on O'Brynes Ferry Road descends to the Tulloch Reservoir which serves as the Calaveras County Line. The Tulloch Reservoir impounded a small section of the Stanislaus River which once crossed by O'Bryne's Ferry in 1958 when Tulloch Dam was completed. The O'Byrne's Ferry first opened as a cable ferry crossing of the Stanislaus River in 1852. The first O'Byrne's Ferry Bridge opened in 1852 and was replaced numerous times in the ensuing decades due to flooding on the Stanislaus River. The article below contains a picture of the 1863 Union Covered Bridge which used to occupy the site. E15 in Calaveras County ascends a small bluff from the Tulloch Reservoir on O'Brynes Ferry Road. Interestingly the Postmile paddles in Calveras County resemble those from Caltrans which makes E15 on O'Byrnes Ferry Road appear as it on "CA 48" at casual glance. Near the north terminus E15 enters Copperopolis on Main Street. Copperopolis was founded in 1860 and was the second major copper strike in Calaveras County after Telegraph City to the west. During the Civil War the copper mines in Copperopolis closed but they reopened in the 1880s ensuring the community survived. Copperopolis largely has been replaced by a modern and in my opinion garish looking facade of a Gold Rush era town to the west along CA 4 but there are a couple authentic buildings located on E15. The Copperopolis Armory dates back to 1864 and saw use in during the Civil War. Reed's Store dates back to 1861 and was once the headquarters of the Union Mining Company in 1906. E15 ends at CA 4 in Main Street in Copperopolis.